Notes: Hi-fi specialists Grado specialise in rich warm and unique sounding audio equipment. The Grado DJ100i is built and designed to meet the demanding needs of the professional DJ. These cartridges deliver performance never known before in the pro DJ market. The Grado specially engineered transmission line cantilever allows for the ideal transfer of music signal and for safe and effective stylus back-cueing. The prestige model DJ100i uses a 3-piece otl cantilever technology, oxygen free wire in the coils and a specially designed, high polished, diamond mounted in a brass bushing. For possibly, the most advanced DJ cartridges ever offered to the professional DJ market. This lifetime package includes 2 replacement stylus to ensure the Grado sound can be enjoyed for as long as possible. Notes: The Grado DJ200i is hand engineered for a premium quality rich warm and unique sound, the DJ200i is built and designed to meet the demanding needs of the professional DJ. A step above anything else in this price bracket and many cartridges priced significantly higher. The Grado specially engineered transmission line cantilever allows for the ideal transfer of music signal and for safe and effective stylus back-cueing. The prestige model DJ200i uses a modified 4 x piece cantilever technology, oxygen free wire in the coils and a specially designed, high polished, diamond mounted in a brass bushing for possibly, the most advanced DJ cartridges ever offered to the professional DJ market. Notes: The Kyowa Stanton 500AL is suitable for replacement for Stanton D5100AL, D5100AL Mk2, D5107AL, D5107AA styluses. 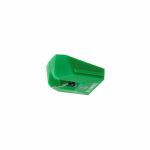 Fits Stanton cartridges 500A, 500AA, 500AL, 500AL Mk2, 500E, 505SK, 505SK2, 520SK. 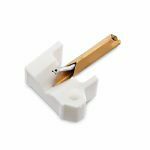 Notes: Replacement stylus for the Carl Cox Signature CS-1 Cartridge. These are sold individually. Notes: The Reloop Concorde Vibe Stylus is a high-quality, replacement DJ stylus designed for use with the Reloop Concorde Vibe DJ Cartridge. This premium-grade replacement stylus is ideal for the touring DJ, allowing you to easily replace the stylus, minimise performance issues. The elliptical design of the Vibe DJ Stylus creates maximum contact between the stylus and record groove, capturing the rich details sound your vinyl produces. The highly robust and lightweight design is made for reliability, ensuring high output levels and a flat frequency response. Notes: A popular replacement stylus. Individually packed in a plastic case. Made in Japan. Notes: Replacement Styli for Stanton 505 and 500 Will fit Mk1 MkII and V3 cartridges. Models 500A, 500AA, 500AL, 500AL Mk2, 500E, 505SK, 505SK2, 520SK. Stylus manufactured by Kyowa. Notes: Replacement Stylus for Stanton 505 and 500 Will fit Mk1 MkII and V3 cartridges. Models 500A, 500AA, 500AL, 500AL Mk2, 500E, 505SK, 505SK2, 520SK. Stylus manufactured by Kyowa. Notes: Tonar replacement needle/stylus for Shure M-44-7. Diamond tip. Notes: Tonar replacement needle/stylus for Shure N-44-G. Diamond tip. 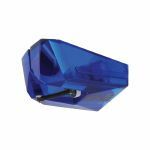 Notes: Tonar replacement needle/stylus for Shure M-92-E. Diamond tip. 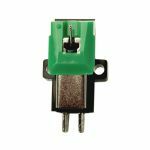 Notes: Tonar replacement needle, stylus for National, Panasonic, Technics EPS-08, EPS-10. Diamond tip (for 33 and 45 rpm records). 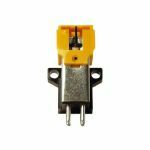 This needle is also used for National, Panasonic, Technics, EPC-83-SMAD, EPC-83-SMED, EPS-10-STDD, EPS-12, Onkyo DN-7-ST, DN-10-ST, DN-17-ST, NEC LP-10-D.
Notes: The Tonar Banana stylus is designed for top performance of Tonar Banana DJ cartridge. Always keep a spare to be on top of your style and music. Notes: Tonar replacement needle/stylus for Shure SS-35-C. Diamond tip.